This paper considers a special case of two-machine flow shop scheduling problems with buffers, namely, the case where all processing times on one of the two machines are equal. This case is interesting because it occurs in various applications, e.g., when one machine is a packing machine. For the buffers we consider two types of buffers that have been studied in the literature for flow shops. It is shown that all considered buffered flow shop problems remain NP-hard for the makespan criterion and permutation schedules even with the restriction to equal processing times on one machine. Two specific heuristics for solving the problems are proposed: (i) a modification of the commonly used NEH heuristic (mNEH) and (ii) an Iterated Local Search heuristic (2BF-ILS) that uses the mNEH heuristic for computing its initial solution. 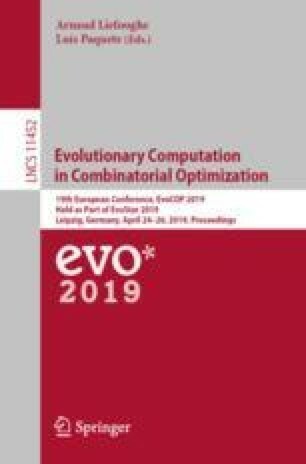 It is shown experimentally that the proposed 2BF-ILS heuristic obtains better results than two state-of-the-art algorithms for buffered flow shop problems from the literature and an Ant Colony Optimization algorithm. In addition, it is shown experimentally that 2BF-ILS can obtain the same solution quality as the standard NEH heuristic with a smaller number of function evaluations. This work was funded by the Deutsche Forschungsgemeinschaft (DFG, German Research Foundation) - project number 392050753.